Chennai Sangamam is primarily an initiative of Kanimozhi( Now, we all know who she is. and if you did not know, she did a few good things as well) and is organised by the Tamil Maiyam and the Department of Tourism and Culture, Government of Tamil Nadu . It is an annual event which aims to revive the traditional and cultural forms of rural folk art . This festival takes places during Pongal, the harvest festival and is spread over a period of seven days. During the seven days,talented artists from all over the state perform in prominent parks and beaches in the city. Along with the dance and music, food stalls are put up, showcasing traditional delicacies, adding flavour to the festival.It is thrown open to the public. As a native of Tamil Nadu, who hasn’t been to any of the remote villages, or witnessed the culture of the rural areas, personally, Chennai Sangamam is a welcome gesture. Its really nice, getting to know more about our native places in terms of their culture and way of life. I was always interested in this kind of a festival..I half heartedly accompanied by dad to Tnagar, on the eve of Pongal, since he wanted to take pictures of the lights in Venkatnarayan Road. 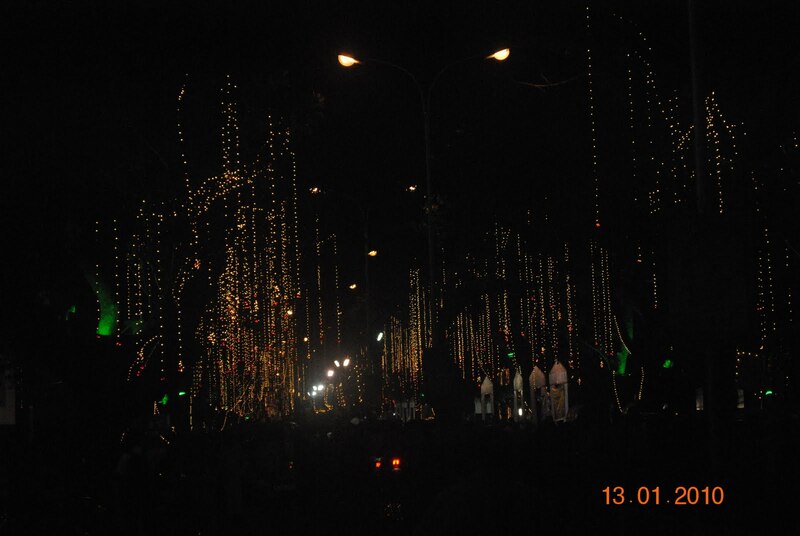 What was so special about it was, the lights there were sponsored by the Panagal Park, Usman Road Shop Owners’ Association and that was one of the reasons, why people thronged to that area. 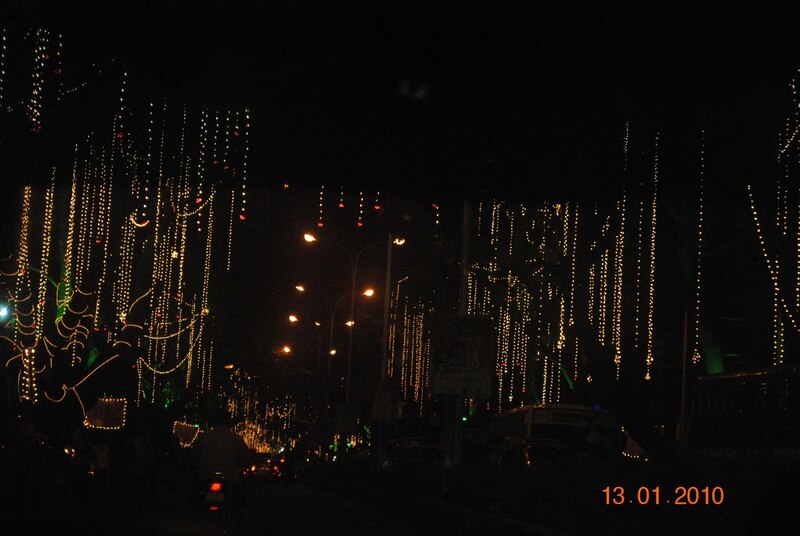 The lights that adorned the area, was such a blissful slight. That was the sole reason I agreed to go with dad. On reaching, we found the music and dance hard to resist, and I should say, the smell of Briyani was tempting me. So we parked our car near TTD temple and took a walk to where all the activity was. 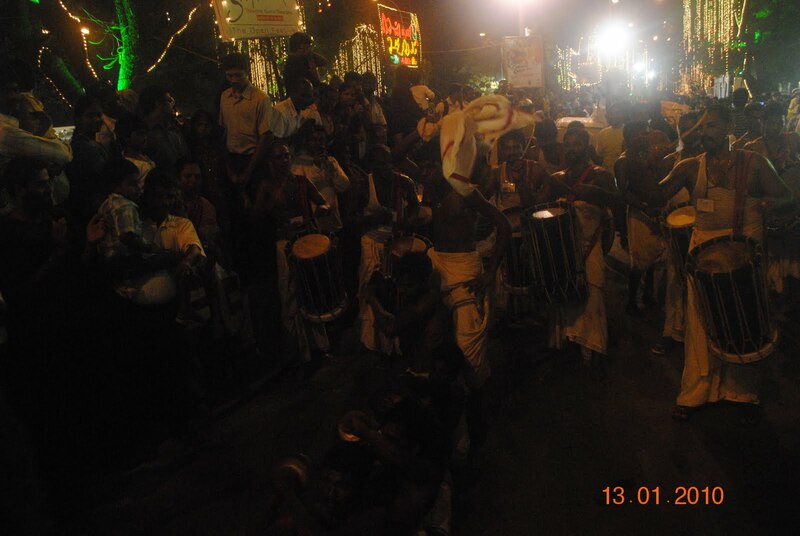 Mom said it was just like a thiruvizha, when we got there. It indeed was.There were different dances going on simultaneously on both sides of the road, and people were standing over the median to have a glimpse of what was happening on either sides.Mom and Dad told me about the different dances and the places where they were famous and I listened to them in one ear and the sounds of all the instruments filled my other ear.Even in my wildest dreams, I never thought I would stand over a median, but yea, I did and tapped my feet along with the beats of the instruments that were being used. Dad was having a gala time, taking picutes in his camera of each and every performance that was taking place, while mom and I settled near one of the dances. There was silambattum in one part of the road and acrobats on the other side.I really had a wonderful time enjoying the dance and music.And for the first time ever since I know, I cursed myself for having eaten at home because the smell of Kerala parotta and dindugal briyani were too tempting. I had already had my dinner, but still I did not want to go back without tasting anything, so finally after much thought, i got bhajjis from one of the food stalls and how could i ever return home without an icecream? So after eating the hot bhajjis, I got icecream from a local Kwality walls vendor. There was a karagatam going on near the newly opened Krishna Sweets and since it was Pongal the next day, they gave everyone hot sweet-pongal. After what dad said was the 23rd time I yawned, we decided to call it a day and left for our car. Back in the car, I took a last look again at the brilliantly lit up road and admired the way it was dazzling. Hats of to all the co-ordinators and organisers of this grand festival for taking pains to deliver such a splendid programme. 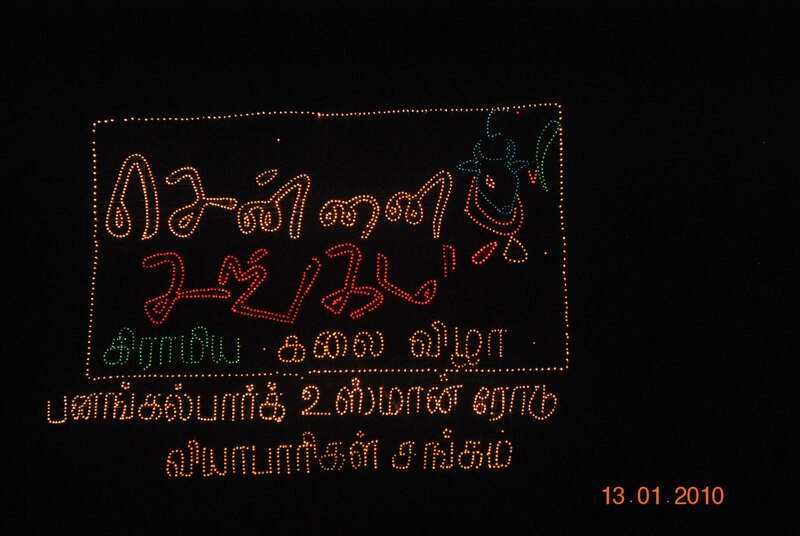 All the Best, Best wishes for Chennai Sangamam 2011! Hi Ash 🙂 ! Nice articles. I went through most of them, found them interesting and good work. Keep it up!